Creatine occurs naturally in the body; it is present in every human cell and functions as an energy store. Depending on body weight and muscle mass, the body stores between 100 and 150gms of creatine, of which about 2 to 4gms are used every day for normal activity. Half of the required creatine is produced by the body itself, the rest must be obtained daily from food. Creapure is the only Creatine monohydrate in the world to be consistently tested free from impurities and by-products. It is the only choice for those who want a research proven safe source of Creatine. This is especially important since other sources of creatine potentially contain impurities and by-products including creatine (CRN), dicyandiamide (DCD), Dihydrotriazine (DHT) and Thiourea. You must be 18 years or older to purchase this product. Loading phase, Take 5g (approximately one level 5ml measure) and mix with 500ml of water, fruit juice or meal replacement, consume one serving daily. Not to be used by pregnant or lactating mothers, this product is a food supplement and should be used in conjunction with food as part of a healthy balanced diet, not as a substitute for such. Use as part of a healthy and active lifestyle. This product is not intended for use by persons under the age of 16, keep out of reach of young children. Do not exceed the stated dose. 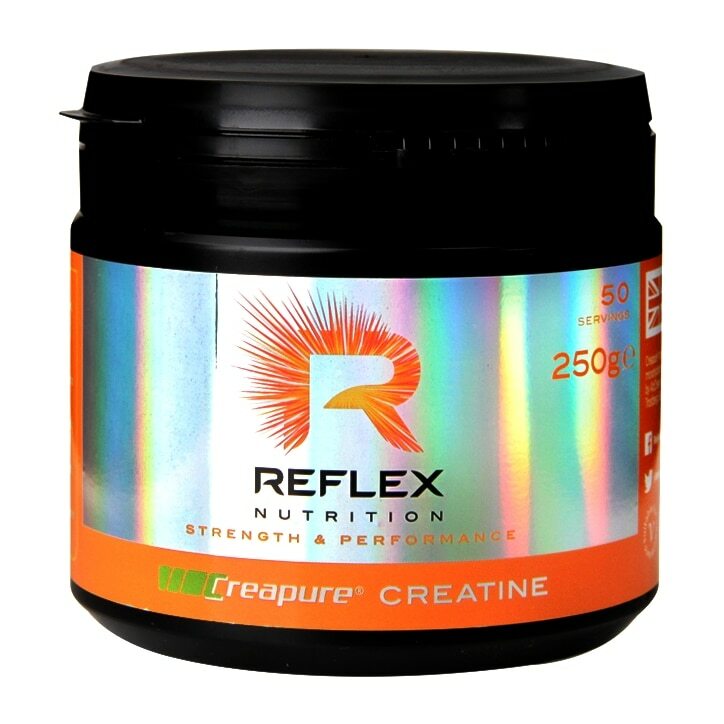 Reflex Creapure Creatine is rated 4.5 out of 5 by 8. Rated 5 out of 5 by Spioradsaor from Creatine Superb Superfast delivery and an excellent product. I've used a variety of creatine over the years This is without a doubt the very best. Rated 5 out of 5 by 8i11y from Excellent product Did loads of research prior to purchase so I was pretty sure I was getting what I wanted. I have not been disappointed. Great product at a good price. Easy to take, no bad taste, mixes easily. Rated 4 out of 5 by Salamanda from Like it Well worth the price bit difficult to dissolve but overall happy with product. Will be buying more when I run out.